On April 10, the Minister of Defense of the Republic of Azerbaijan, Colonel General Zakir Hasanov has met with the Ambassador Extraordinary and Plenipotentiary of the Russian Federation to our country, Mikhail Bocharnikov. During the meeting, prospects for the development of cooperation between Azerbaijan and Russia in military, military-educational, military-medical and other spheres, including new projects in the field of military-technical cooperation aimed at enhancing the combat capability of the Azerbaijan Army were discussed. The sides exchanged views on organizing working meetings between delegations of the Ministries of Defense of the two countries, conducting joint military exercises, continuing mutual visits of warships of both countries in the Caspian Sea and other issues. 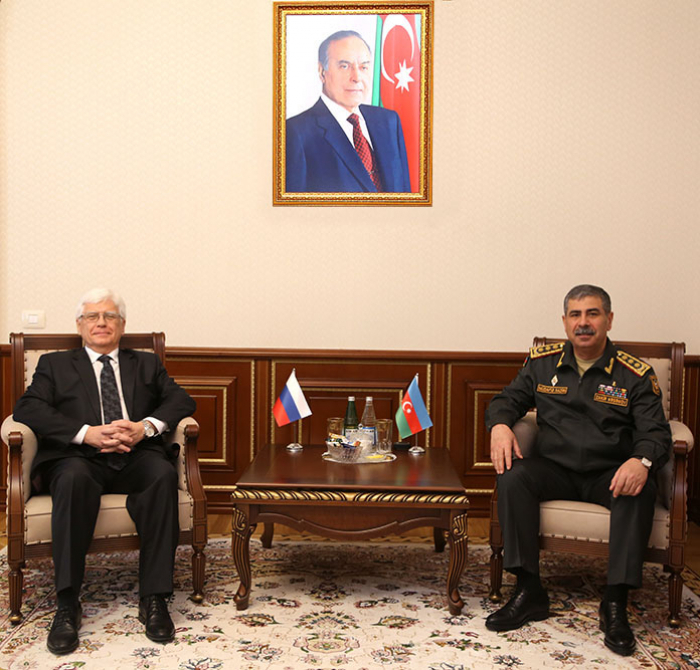 The Ambassador presented the newly appointed military attache of Russia in Azerbaijan, Colonel Andrei Alexensev to Colonel General Zakir Hasanov. The Minister congratulated the new military attache in regards to the beginning of his activities in our country and wished him success in expanding military cooperation between Azerbaijan and Russia.